Ella Rhodes reports on a report concerning vaping, from the House of Commons Science and Technology Committee. The committee pointed to evidence that e-cigarettes, first introduced in the UK in 2007, are around 95 per cent less harmful than normal cigarettes and offer an opportunity to tackle one of the leading causes of death in the UK. An estimated 2.9 million people in the UK have used e-cigarettes to stop smoking, many tens of thousands successfully, but some remain concerned over their potential long-term effects. In written evidence the British Psychological Society made recommendations to the government to better educate the public and current smokers of the relative benefits of e-cigarettes in quitting smoking. It also suggested raising the cost of conventional cigarettes further while reducing the cost of e-cigarettes as well as 'vape-free' legislation. Many commentators on this topic have pointed to worries about e-cigarettes being a gateway into real cigarettes for young people but this report points out there is little evidence for this. Similarly risks to bystanders from second-hand vapour, it says, have been difficult to measure as it is 'negligible and substantially less than that of conventional cigarettes'. 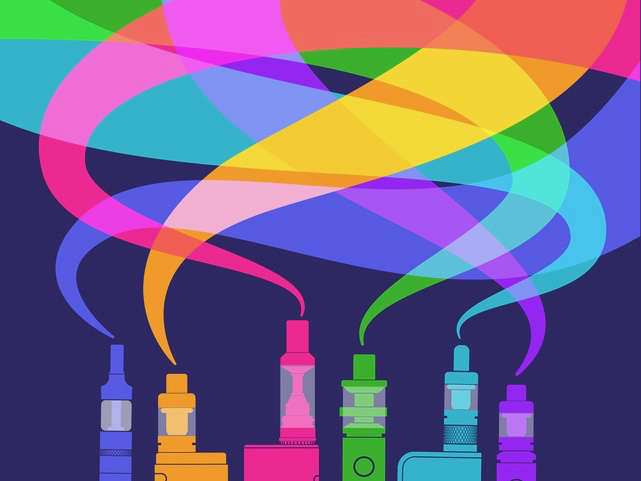 The report recommends that the government should stick to its planned annual review of the evidence on e-cigarettes and support a long-term research programme into their effects. It also suggests that the NHS should allow e-cigarettes in mental health facilities given that people with mental health problems have some of the highest rates of smoking and smoking-related deaths – yet the devices are banned by many trusts. - See also the British Psychological Society's behaviour change briefing on e-cigarettes.